With a museum inside, on the ground floor. Lovely Islamic architecture, gardens. Great place for photography, the light upstairs is lovely, since it is open on all sides.There is a beautiful temple also right next to it, you can club both. 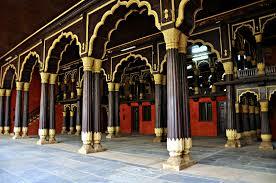 This is in South Bangalore, you can club it with visits to Bull Temple, Gandhi Bazaar, Lal Bagh Botanical Gardens. Tipu Sultan (20 November 1750 – 4 May 1799), also known as the Tiger of Mysore, Dipu Sultan and Tipu Sahib, was a ruler of the Kingdom of Mysore, scholar and poet, recognized as one of the greatest South Asian rulers of all time. ..Tipu expanded the iron-cased Mysorean rockets and wrote the military manual Fathul Mujahidin, considered a pioneer in the use of rocket artillery. He deployed the rockets against advances of British forces and their allies in their 1792 and 1799 Siege of Srirangapatna. ...Napoleon, the French commander-in-chief who later became emperor, sought an alliance with Tipu. In alliance with the French in their struggle with the British, and in Mysore's struggles with other surrounding powers, both Tipu and his father used their French trained army against the Marathas, Sira, and rulers of Malabar, Kodagu, Bednore, Carnatic, and Travancore.